The page describes TVS Thyristor Selection Guide including popular TVS Thyristor manufacturers. This guide helps in selecting appropriate TVS Thyristor from multiple Manufacturers. TVS thyristor symbols and characteristic are also shown. Transient over voltages and surges in electrical environment occur due to power switching, EM radiation, electrostatic discharge, lightning etc. TVS thyristor is an electronic component used to protect electronic circuits from over voltage transients induced on wires due to these occurrences. TVS is the short form of "Transient Voltage Suppression". 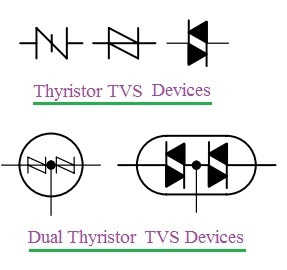 The figure-1 below depicts TVS thyristor symbols. Following are the basic functions of a TVS Thyristor device. • It provides protection to people from the hazardous voltages induced due to power line contact or lightning. • It limits maximum voltage seen by the equipments. • It diverts very high transient currents to the ground and keep it away from the equipments. 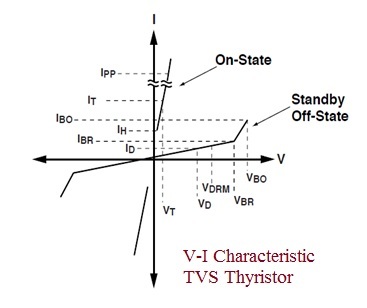 TVS Thyristor characteristic is shown in the figure-2. Following specifications are considered while selecting TVS Thyristor for desired application. Following table lists out popular TVS Thyristor manufacturers.